Note that I usually eat only 0-3 carbs for breakfast, which leaves me plenty for lunch and dinner indulgences. This breakfast is 8 carbs, so here is what I will eat for the remainder of the day to stay on course. Lunch will be a green salad with cherry tomatoes, sliced chicken breast, and low carb dressing (7 carbs); dinner will be NY steak (roughly 8 ounces) served with 1 Tbl of béarnaise sauce, 4 asparagus spears with 2 tsp of mayonnaise, and Sugar Free Jello cup for dessert (3 carbs) Afternoon snack will be 12 almonds and 1 wedge of Laughing Cow Cheese (4 carbs) Total for the day will be 22 carbs – not bad! See Low Carb eating can still be healthy AND you can have a treat now and again. Since I have pretty much eliminated sugar from my diet (no candy, cakes, pies) I thought I would want to splurge on those items – but no, I find I am missing potatoes and bread – oh where, oh where did my potatoes and bread go? Cut sausage in half, and then into slices. Add to non-stick fry pan with 1 Tbl butter (freeze the other 4 oz for another day). Once it starts to cook take a metal spatula and smash it! This will release the fat particles in the sausage. You can either turn down the heat and let this cook for about 7 minutes, stirring constantly, or you can keep heat on high until a crisp crust forms – I like the crust! 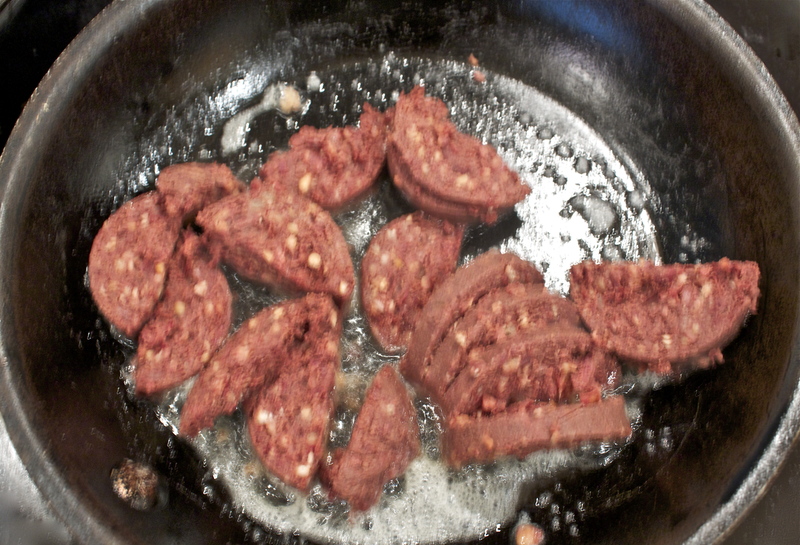 Divide the fried blood sausage between two plates and wipe the fry pan with a paper towel. Add rest of butter and fry two eggs over easy. 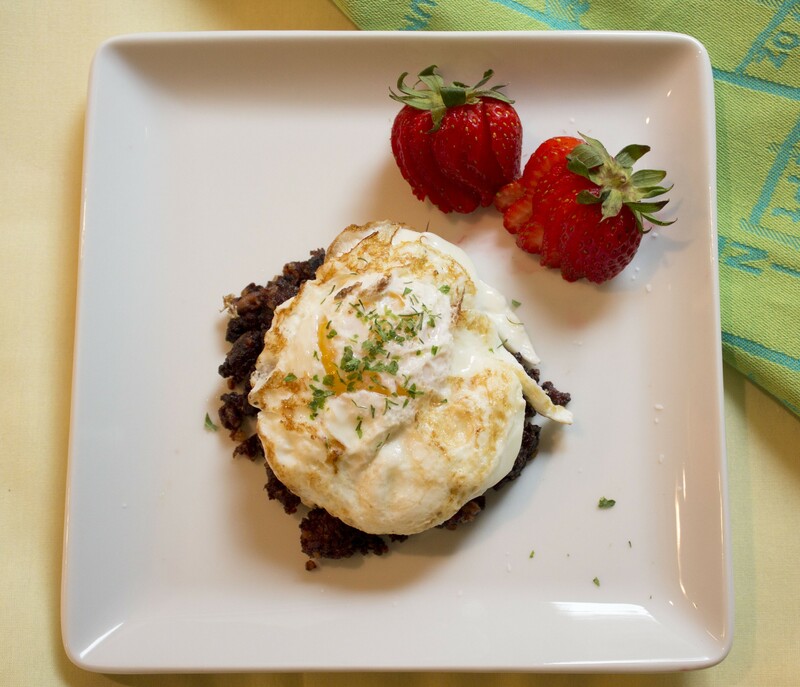 Place the fried egg on top of the blood sausage, sprinkle with a touch of salt, dill, and parsley, add two medium size strawberries and you are ready for breakfast! 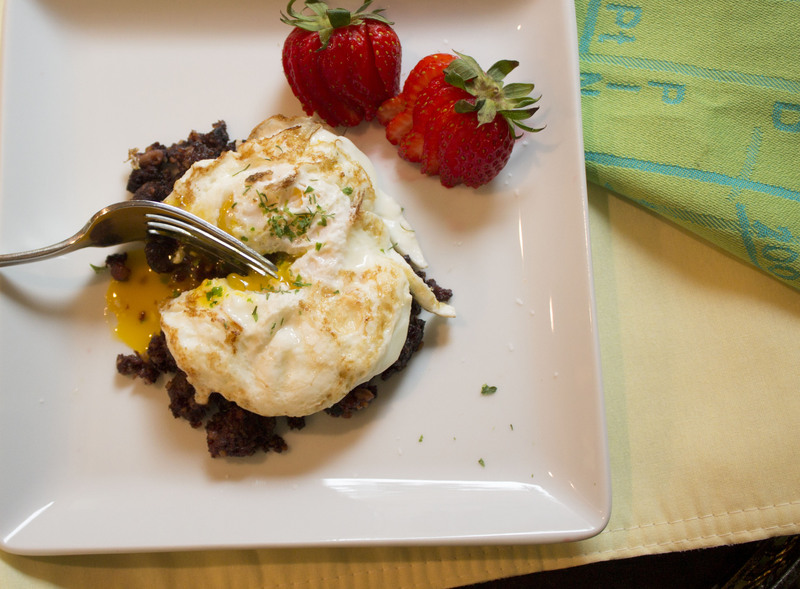 First bite: I love the first bite of this breakfast when you dig right into the egg yolk and it starts to run over the blood sausage – Yikes that is a good first bite. Love that is sounds so indulgent and only a measly 8 carbs. I find low carb is probably the easiest diet to follow once you get used to having low/no sugar. What a delicious breakfast and the rest of the day sounds great. Thanks Suzanne! Just finished the day, and came in under 25 – so was pleased that I had both satisfying meals in taste, but also healthy. Thanks for visiting! This is one sausage I’ve not tried. Blood sausage was just never something we made or ate. I don’t believe there’s an Italian version. On the other hand, it sure looks good with that egg on top and your description of the yolk spilling forth makes this one irresistible dish. No, I don’t think there is an Italian version either – it’s pretty much England and Ireland – and I think Portugal has their own version too. Try it sometime, it’s definitely a treat, especially if you like spicy food. Actually in Italy, there are regional varieties of Blood Sausage generally referred to as “sanguinaccio” (I hope I am spelling that correctly). Most countries and around the world, from what I’ve heard, have their own version of blood pudding/sausage and I have tried a few of them over the years. But I do seem to prefer the English/Irish version most of the time, probably because it was the taste I was most familiar with. As a kid who also grew up in San Francisco (Sunset district), your blood sausage with eggs fried over-easy on top really brings back fond memories for me especially during those foggy mornings when a bowl of cereal just wouldn’t do. Of course my “portions” were MUCH greater back then, and included were some delicious homemade hashbrowns and some liberally buttered toast (sourdough of course). Anyway I thank you for “bringing back” this delicious breakfast treat to add back into my menu plan. I was able to find a specialty sausage market here in Phoenix that sells blood sausage (Portuguese style I believe, but still quite delicious) and once again enjoyed a taste of home. P.S. Dill was never used as an ingredient in my “old” breakfasts, but it is a fabulous addition. Well done!